To buy the Emperor's Puffs, queue here. Many times I’ve found myself at Chinatown in the Sydney CBD when I’ve noticed a huge queue at the Paddy’s Market end of Dixon Street. 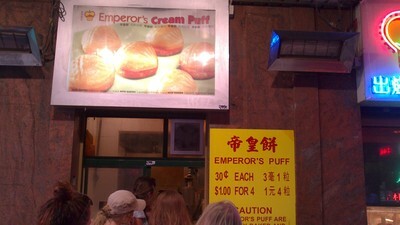 People happily line up for these mysterious creations called Emperor’s Puffs. 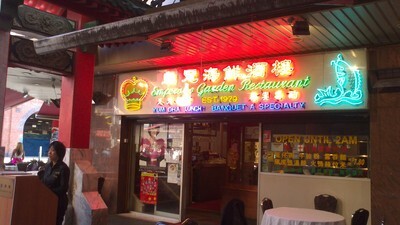 Between the Emperor’s Garden Restaurant and Emperor’s Garden Cakes & Bakery is a small window from where the queue trails. With a curious mind, I knew one day I’d find myself at the front of that queue. 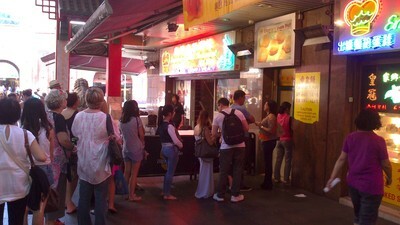 Sure enough, the other day, I’m in Chinatown and noticed the queue wasn’t quite as long as it normally is. So, without hesitation, I jumped on the end. 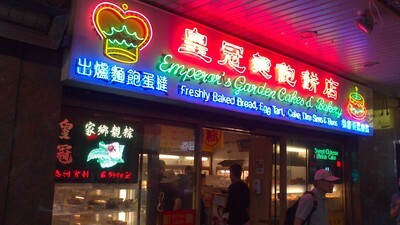 The sign on the wall says Emperor’s Puffs are just 30 cents each or 4 for $1. That sounds reasonable, so what did I have to lose. It’s no wonder the queue is always long and slow. People buy dozens of these things at the one time. Although I was only about six people from the front, it took me almost 10 minutes to reach the window. 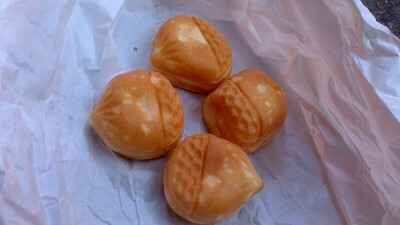 Inside, a machine cranks out a small ball of light pastry, and then injects it with steaming hot custard. The sign warns you that these things are hot. Take the sign seriously. When I reached the front of the line, there was another sign that warned ‘No photos.’ Why it’s there I’m not quite sure. Perhaps too many people were holding up the queue taking photos. Or perhaps they’re worried someone will copy the puff making machine. Who knows? And just what happens if you do flaunt the rule and snap one out for Instagram? I wasn’t about to find out in case I miss out on my puffs. Don’t expect friendly service. You won’t get a ‘hello,’ a ‘please,’ a ‘thank you,’ or a smile. Not even any form of eye contact. Just a quick cash transaction, puffs in a bag, and away you go. So what are the Emperor’s Puffs like? The custard is very hot and catches you by surprise, because the puff pastry on the outside cools faster. The custard is thick with a nice eggy taste; not too sweet but satisfying as a treat. The Chinese, while superb at savoury cooking, are not renowned for their sweets and desserts. This one was very nice. And who could argue with the value? However, to be honest, I prefer an Italian or French custard sweet. Good for kids: Yes, but be careful, they are hot on the inside. Take away: Nothing but take away.